I know, it is hard to believe that anything can actually be made on this workspace. A big thanks to Stamping Ground for hosting WOYWW #224. If you want to learn more about this fun hop head on over here. I hope that you enjoyed your peek into my creative space. Thanks so much for stopping by! Have a magical day! There's some great stuff on your desk! LOVE those snowflakes! Do you have a die to cut them? That looks a bit like my sewing room! Lol Brenda! I hate that things just don't jump back where they belong! Lots of fun stuff. Can't wait to see what you do with all of those. Love all the glittery things on your desk! 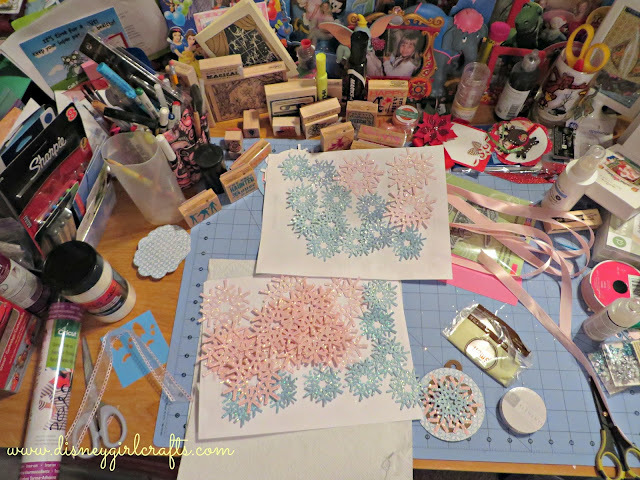 Oh I do love a good creative mess! Those are such gorgeous, glittery snowflakes! What are you planning to do with them? Looks like snow much fun! I had to do it! LOL. Can't wait to see you for real tomorrow!!!! !